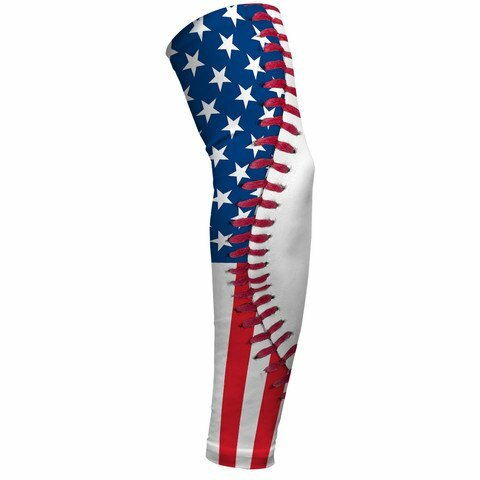 Perto Rico Flag Baseball Lace Arm SleeveThe SLEEFS compression arm sleeves are made of tough non-woven antibacterial 80% polyester and 20% spandex material yet have a second-skin feel offering an excellent sun protection (UPF 50+).They are manufactured with a seamless design for ergonomic fit and come with a 6-thread flat-lock technology for strength at the seams. The sleeves resist ripping and tearing and can be used in all weather conditions.All sleeves designs are designed in USA.Care Instructions: Machine wash cold. Do not bleach. Line dry. Do not iron. Do not dry clean. If you have any questions about this product by SLEEFS, contact us by completing and submitting the form below. If you are looking for a specif part number, please include it with your message.